QUANG TRI (VNS) — The central province of Quang Tri's Huong Hoa District police seized smuggled goods worth hundreds of millions of dong in Lao Bao Township on Thursday. Police discovered several motorbike drivers transporting large amounts of illegally imported cigarettes as they drove through the township. Officials report that as policemen were checking the smuggled goods, the suspects ran away. The confiscated goods included 5,000 packs of cigarettes illegally brought in from Laos through the border gate. 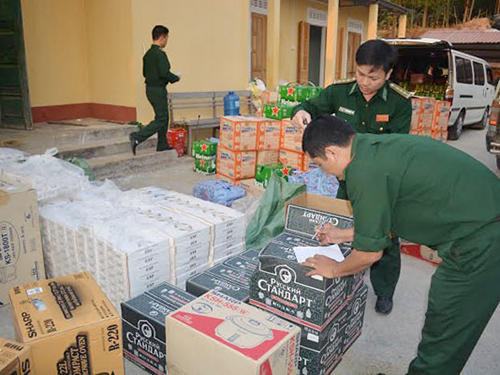 Following their seizing the cigarettes, policemen later confiscated 3,400 Heineken-brand beer bottles at a residential house at Tay Chinh village in Lao Bao township. The owner of the house, Nguyen Thi Dao, 68, said she was paid to store the smuggled goods. Meanwhile, the Ha Noi City market management department, in co-ordination with Hoang Mai District police, seized 1,400kg of illegally imported candy. The owner of the bonded goods, An Van Tuan from the village of Hung yen in the northern province, did not present an invoice or food safety licence for the goods.